I was reading about this exorbitant peacock feather wedding gown the other day, and wondered "Do I like peacock?" It is not something I've ever tried, or even considered. Lately I feel as though I've been seeing it quite frequently. H&M's new designer line features this blue dress printed with peacock feathers, going for 70 dollars, or is that euros? Either way, I don't think I'm ready for that much peacock. 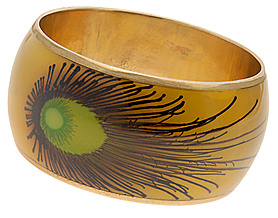 I did however, find this bangle at Aldo for $12, and it is decidedly 'just enough'.